We thought that our 2007 Holiday Guide to iCrap was pretty comprehensive, what with the iPod Tooth Whitener and all. 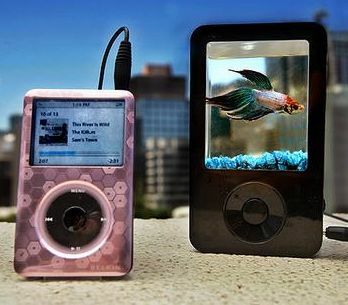 The iPond is a tiny fish tank that doubles as a music speaker. Unfortunately, it’s a tiny fish tank that is about 15 times smaller than the recommended tank size for the fish it holds. The tank’s water capacity is only 650 millilitres once rocks are placed in it. And the fish get to vibrate along to the music, courtesy of the cheap speaker built into the iPond. The RSPCA has called on the device to be banned because it is too small to provide fish with adequate oxygen supplies and a clean environment. The ipond is not made by Apple, so don’t blame us. The poor fish can’t even turn around. All it can do is bob up and down. Also, where/how do you feed it? This reminds me of the fish disco shoes. This is the result of humans considering non-human animals as property. Humans are so strange, weird, Wack, dumb, stupid and most off all evil !! i am ashamed to say im a human. I would love to have a chatt to the sicko’s who invented it and OK’d it. I actually own, this. It has atrocious SQ… but it is neat to have a “portable” fish tank, I actually really like the idea, I am going to buy another one ( if I can still get one ) for my mother. I suggest you take the convenience for the animal into consideration before you own. For less than $100 you could have set up a larger tank with a better environment for the fish. That is the worst kind of animal cruelty!!! How would you like it if someone kidnapped you from your home, stuffed you in a box where all you can do is sit up, NOT STAND, and then blared music so loud you vibrated all day? And maybe into the night? It got humid in there and you started to suffocate, and then it got so hot in there, you died. Would you like that? Didn’t think so!!!! Someone has to do something!!!!!!!! Whoever created, sells, and buys this stuff are animal cruelty idiots!!!! This is the meanest thing I have ever seen!!!! The poor fish can’t even move in there and how is it supposed to eat… not to mention, BREATHE!! I can’t even imagine someone who would be willing to buy this… well other than to set the poor fish free! I work in a pet store, and grief people are so misinformed. For example, did you know that a goldfish’s life span can be 25 YEARS?- that is, if its not kept in a bowl. Betta fish are actually incredibly intelligent- I have two. They can live up to 4 years when properly taken care of. This is as stupid as that “self sustaining kit” they sell where the betta’s poop feeds the plant, and then the betta eats the plant….THEY”RE CARNIVORES PEOPLE-THEY EAT BRINE SHRIP AND FISH MEAL-NOT PLANTS!!! Ugh. A betta will not survive long in there. Bettas breathe by gulping air from the surface. It will suficate. Really, whoever came up with this is retarded, and the people who buy it are even dumber. this wouls be a great idea!!! if it was like 100x bigger and 100x wider. that honestly is pretty retarted. i mean yeah, betas dont move a lot, but that doesnt mean you make it so it cant move at all. This is a stupid idea. Aside from the usual arguements over the size of the tank, has anyone realized that MP3Players are PORTABLE and would therefore be SHAKING the up? And it also doesn’t look like it has an opening to feed it. I’d rather have a real screen on my iPod, so I can tell what song I’m actually playing. As soon as people realize that it’s impossible to keep the fish alive, and that the iPonds serve no purpose otherwise, the sales will drop and the product will disappear. It won’t even have to be recalled. Seriously, who would even think of this? Whoever did really is an idiot.